I never realized how much I wanted to see Aquaman beat up Superman until this happened. 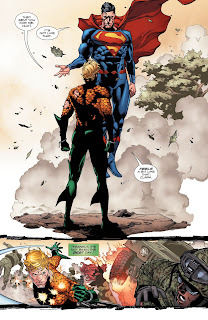 I always get a sort of glee watching the Man of Steel get thrown around by the little guy, even if the little guy in this case happens to be the almighty King of Atlantis himself. For those of you who had the pleasure of reading The Dark Knight Rises, there is certainly a throwback feel to the epic fight between Batman and Superman in this issue, except Aquaman is standing in for an elderly Batman and it’s not quite as epic, but still incredibly fun to watch happen. The story picks up at the halfway climax point where Aquaman and his Atlantean army confront Superman and the surface forces, mostly in the form of the US military. This tense standoff is only the beginning of an even bigger confrontation to come, as Aquaman must prove himself to both the Justice League and the people of the surface. 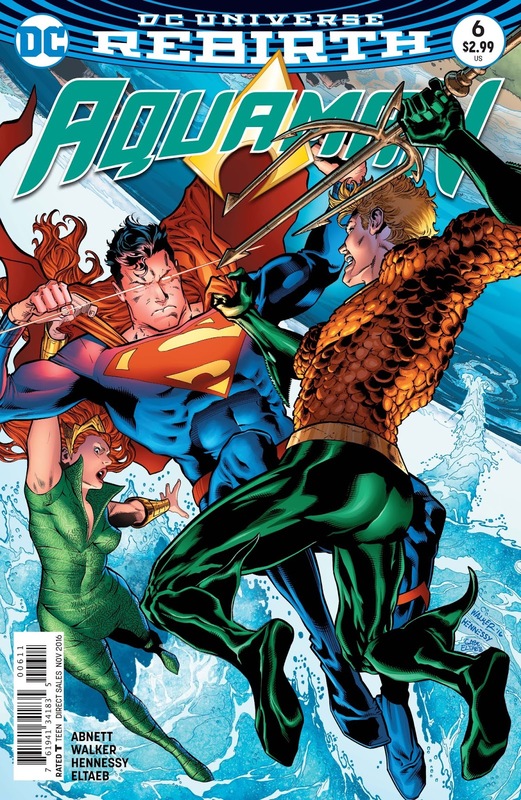 This issue is also focused on the “Aquaman is just a lame fish-dude” idea, as Aquaman himself tells Superman he believes he is the outcast of the Justice League. By going toe-to-toe with Superman, he proves himself to be just as capable as any other League member and the King of his people. No doubt that this story is either going to cement Aquaman’s place in the League or reveal his unworthiness. As a bonus, Queen Mera gets a good punch in herself on Supes, which is just the perfect cherry on the top. The Verdict: This issue is pure fun in terms of the fight scenes going on, but it also tackles that ever-present image we have of Aquaman being the lamest member of the Justice League. I would suggest going back and reading a couple of issues before this one to get caught up on exactly why Superman and Aquaman go head-to-head, but this is certainly worth the wait.